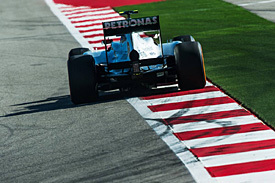 Outgoing Mercedes boss Ross Brawn believes the squad is well placed to make a strong start with Formula 1's new regulations in 2014. Mercedes finished second in the 2013 constructors' championship, its best performance since returning as a constructor, and Brawn thinks Mercedes is making good progress for next season. "If I said Mercedes were completely on target, I wouldn't be telling the total truth. But I think they are no worse than any other car builder," Brawn told AUTOSPORT. "You set your objectives, you set your programme, you have stakes in the ground. All the major things, the chassis, the gearbox, all those things are coming together well. "There are always some things that slip a little bit but nothing unusual in my experience. It is in pretty good shape." Brawn confirmed that the new rules, including the switch to 1.6-litre turbo engines, require more work during the winter than normal. "There is a huge amount of work going on at the factory, the guys are working 6-7 days a week now," he added. "This really is a project from a clean sheet of paper. "There is very little carry through from this year to next year in terms of components. There is carry through in terms of technology, but not components."